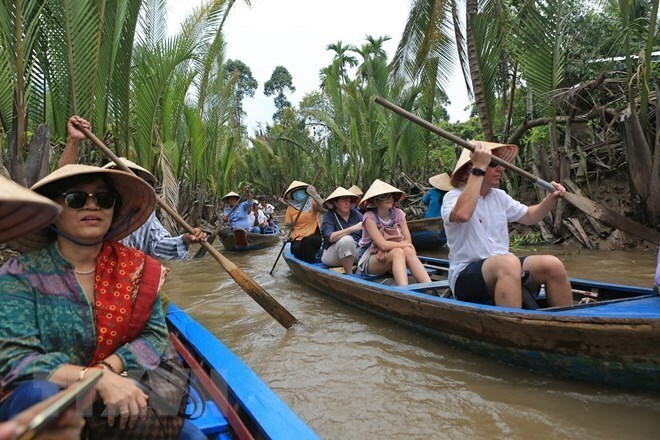 The Vietnam Tourism Association (VTA) will launch a programme to rank Vietnamese tour guides, with financial assistance from the European Union (EU), the association announced on October 4. This is the first time Vietnam has implemented such programme, which aims to encourage tour guides to improve their performance to better meet travelers’ demand. From early October to the end of this year, VTA’s Association of Vietnamese Tour Guides will conduct ranking activities in Ho Chi Minh City, Hanoi and Quang Ninh as well as other localities such as Khanh Hoa and Lao Cai. The ranking will be based on three major criteria of capacity, knowledge and skills, and aims to create favourable conditions for travel firms to sign contracts and pay adequate wages to tour guides. It is expected to help enhance the quality of Vietnamese tourism, especially tour guides who will be classified into three levels from three-star to five-star. Vu The Binh, VTA Vice President, said that initially, the programme will be applied for members of the Association of Vietnamese Tour Guides across the nation. After the completion of criteria and regulations, it will be expanded to all tour guides in the countries who wish to join the programme, he added. So far, Vietnam has 23,055 certified tour guides, including 14,428 international, 8,412 domestic and 215 working at certain sites. However, only 5 percent of the total are working under contracts with travel firms and paid with salary and social insurance premium by the companies, while the rest have not joined social insurance.